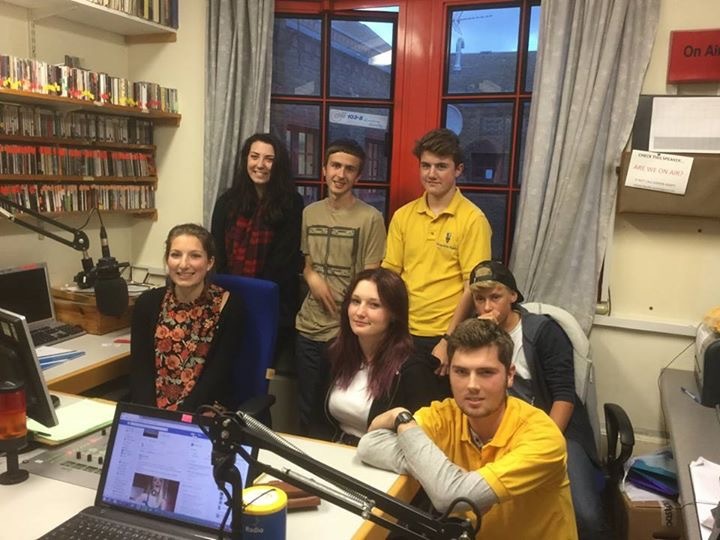 Pictured are a few of the Kingfisher team from when were in the finals (for the second year running) for the Hospital Broadcasting Awards 2015. On Friday 25th and Saturday 26th October our fund raising team were, once again, packing bags for supermarket shoppers to raise much needed funds. This time they were at Tesco (Dorchester) and followed another successful bag pack at Weymouth’s Morrisons earlier this year. Our bag packing / fund raising team were Abi, Aidan, Rosie, Ben, Sean, Tom and Daniel on the Friday with Daniel, Ben and Aidan on Saturday and our Kingfisher Club co-ordinator, Amanda). In just a few hours we received donations of over £150 which will help us to help others ~ requests, visits, talking to others and just generally having an open door in the studio! The Kingfisher team will once again be at DCH’s ‘open day’ on Saturday 10 October from 2pm (1400 hours) to assist visits to the studio, interviewing guests with a ‘live’ show, talking about how we visit (and talk to) guests of the hospital and most importantly being part of a larger team that listens to the guests / patients of DCH . And a huge thank you to all who gave their shiny pennies (and paper pennies) to help us with our voluntary work in Tesco and to all who ‘just love us for who we are and what we do’.